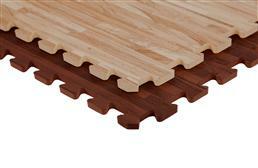 At FoamTiles.com, we carry two different thicknesses of soft foam wood tiles: 3/8" and 5/8". Each thickness is available in either a light oak or a dark oak finish. Both tiles use a printed veneer top surface to mimic the natural look of wood however these tiles can be punctured and/or scratched. 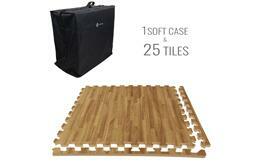 Soft wood tiles install easily and can be cleaned with a simple wipe of a wash cloth. The places where these tiles have been used most commonly include as trade show flooring, as a flooring or matting for kids play areas, and as light duty home gyms where aerobic equipment is used. These tiles are not recommended for use in weight room where free weights are used or where extremely heavy exercise equipment is used. High heels also may puncture the top surface of those tiles so we generally recommend having a few extra on hand if you desire to use them in your exhibit booth at trade shows.